Our hotel in Paris was in the 11th arrondissement; I choose it simply because it was the least expensive hotel on offer from Tablet Hotels and because it was handy both to Gare de l’Est and Gare du Nord, the train stations we were arriving at and leaving from. After an exciting afternoon at Cité des Sciences et de l’Industrie we checked in at the hotel and, while Oliver compared and contrasted Slovak kids TV to French kids TV, I went online to find us a suitable place to eat our one Parisian meal. 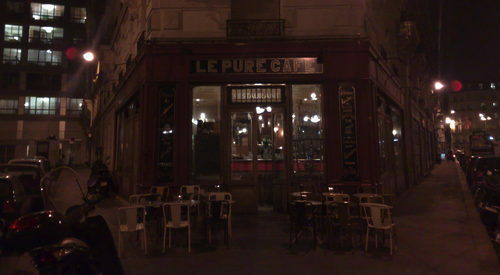 The first place that popped up in the Zagat guide was Le Pure Cafe, which was only a 10 minute walk from the hotel. 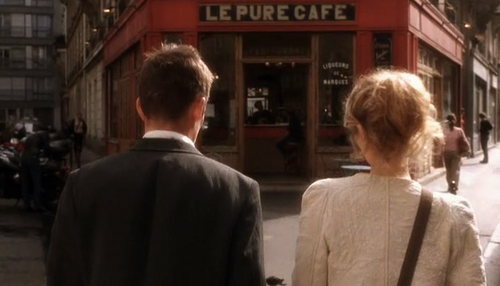 Looking around the net for reviews I quickly found that not only was the food reported to be good, and the atmosphere comfortably “neighbourhood,” but that the restaurant was featured in Before Sunset, the 2004 Ethan Hawke — Julie Delpy film that happens to be one of my favourites. 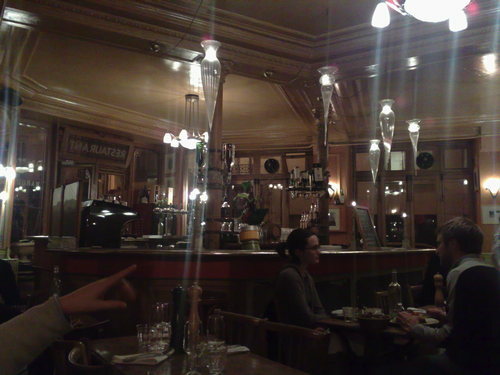 So the deal was sealed: I called to make a reservation for 8:00 p.m.
After ambling over toward 14 Rue Jean Mace — we had some time to kill so we explored the neighbourhood — we arrived right at 8:00 p.m. and were shown to our table by a friendly (and, to my relief, English-speaking) waitress (I can make my way in French in an emergency, but I’m liable to ask for cheveux instead of cheval). Our table for two — right next to the Hawke/Delpy table, appropriate for my fanboy status — was over in the corner. The vibe at Le Pure Cafe is exactly what you think it should be: a casual, comfortable mix of young and old, new and regulars, good music, friendly, helpful staff with a soft spot for Oliver and patience with me. With language and culture translation from our server we ordered the goat cheese samosas with confit of duck to start and salmon for the main. I asked for “something less than a bottle of wine but more than a glass” and received an appropriate flagon of what was described as “a strong wine from the south of France” (it was very nice). The food simply knocked my socks off. This is perhaps partly explained by the fact that any food in Paris would impress me, but it was very, very good, especially the salmon, which almost brought me to tears it was so well prepared. 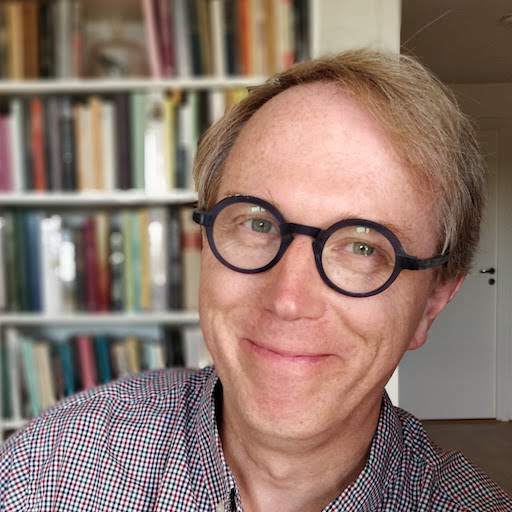 As the night wore on, and I consumed more of my strong red wine from the south of France, I passed more and more of the practical responsibility for the evening over to Oliver (a post he assumed with aplomb); I wasn’t blotto, but by the end of the evening I was well lubricated. We finished the meal with a dessert best described as a “long thing spring roll-like confection filled with molten dark chocolate.” It may be the best dessert I have ever had. We rolled out around 10:00 p.m., Oliver in charge of navigation, happy and well-fed. I cannot think of a better way of spending a night in Paris. Written March 26, 2009 at 9:04 a.m.